Seventh Generation's hypoallergenic Chlorine Free Diapers provide premium absorbency and soft, cloth-like comfort. Unlike most conventional brands, Seventh Generation's absorbent core is processed without chemicals containing chlorine. 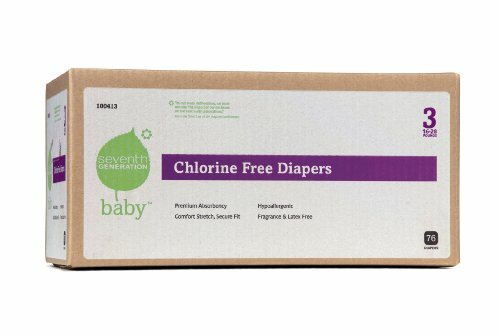 Product Description Seventh Generation's hypoallergenic Chlorine Free Diapers provide premium absorbency and soft, cloth-like comfort. Featuring resealable secure fit closure tabs and a stretchy back gather for improved fit and performance. Unlike most conventional brands, Seventh Generation's absorbent core is processed without chemicals containing chlorine. Our diapers do not contain fragrances or latex, and are free of designs & characters for a simple, natural look. Only the best for your baby! About Seventh Generation Seventh Generation offers a complete line of natural household products designed to work as well as their traditional counterparts, but use renewable, non-toxic, phosphate-free, and biodegradable ingredients as often as possible, and are never tested on animals. Seventh Generation products are healthy and safe for the air, the surfaces, the pets, and the people in your home--and for the environment outside of it. Every time you use Seventh Generation products you make a difference by saving natural resources, keeping toxic chemicals out of the environment, and making the world a safer place for this and the next seven generations.